NEW YORK (CNNMoney) -- Call it the Mad Men effect: retro fashions, debonair dinner parties and especially classic drinks -- like bourbon -- are back with a vengeance. "Despite the recession, consumers decided they wanted to drink better," says Frank Coleman, senior vice president of the Distilled Spirits Council of the United States. Last year, sales of super premium bourbon (the highest price category) were up 17.7% from 2009, according to the council, while total bourbon sales grew at a rate of just 4%. So what makes a bourbon "super premium"? Well, better often means older. Older whiskeys spend more time aging in an oak barrel, which is how they get their caramel color and much of the flavor. "The older they are, generally the more expensive they are because time is money," Coleman explains. But that doesn't mean you have to spend a fortune to have a good bourbon. Liza Weisstuch, a sprits writer and contributor to Whiskey Magazine, says that there are bourbons on the market for under $30 a bottle that could please even the pickiest cocktail connoisseur. For example, Weisstuch recommends opting for the Elijah Craig 12-year-old bourbon ($27 for a 750ml bottle) over the heavier 18-year-old version that costs nearly twice as much. Older bourbons have a higher alcohol content and taste stronger, which is not for everyone, she notes. "You will get an easier, mellower bourbon if it's younger," Weisstuch says. That's particularly preferable when using bourbon in a mixed drink like those trendy pre-prohibition cocktails. Want an old fashioned? Just add bitters, water and a sugar cube to your bourbon. For a Manhattan, the only extra is sweet vermouth. Weisstuch also favors Weller's 12-year-old bourbon ($28 for a 750ml bottle), which is one of the few wheated bourbons on the market. That means it's made from mostly wheat and corn, like the more popular Maker's Mark ($23 for a 750ml bottle). "Small batch" bourbons are just one level below "single barrel" and often times can be value buys. For example, Weisstuch likes Jim Bean's Knob Creek -- a nine-year-old small batch bourbon ($27 for a 750ml bottle). While Jim Beam may be often seen at dive bars and roadside saloons, she notes that there's a huge difference between their white label, which is aged four years, and the black label, which is aged eight years or longer. "Definitely worth a shot -- err ... a try," Weisstuch says. Need something even a bit lighter on the wallet? Charles Cowdery, author of Bourbon, Straight, enjoys a few bargain buys starting at $10 a bottle, including Very Old Barton, Evan Williams and Ancient Age. 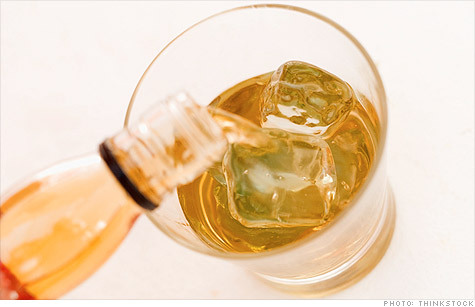 But when it comes to his personal preference, he says, "my favorite bourbon is one that somebody else is paying for."